New Virus Related To Smallpox Is Found In Republic Of Georgia : Shots - Health News Two men have been infected with a virus newly discovered in dairy cattle, scientists say. The disease causes blisters on the hands and arms, and other symptoms similar to those caused by smallpox. Two herdsmen in the country of Georgia have been infected with a brand-new virus, scientists from the Centers for Disease Control and Prevention said Thursday. The newly identified virus is a second cousin to smallpox. And, like smallpox, it causes painful blisters on the hands and arms‎. Other symptoms include a fever, swollen lymph nodes and overall weakness, CDC scientists reported at a meeting in Atlanta. "We consider this family of viruses very important because smallpox could be used as a bioterrorism agent," says disease detective Neil Vora, who led the team that made the discovery. The virus doesn't yet have a name, Vora says, because so little is known about it. "We haven't found any evidence of human-to-human transmission, so far," Vora tells Shots. "But how many people are getting sick? Are animals getting sick? We don't know. ... We don't know if it has caused any deaths." Both of the men who caught the virus fully recovered. But related viruses, such as cowpox, can be deadly for people with suppressed immune systems. And smallpox had a fatality rate of about 30 percent before the illness was eradicated in 1980. Since then, widespread vaccinations for smallpox have stopped. And this immunization gap seems to be opening the door for other viruses in the family — known as orthopoxviruses — to resurface, Vora says. "When you vaccinate a person with one of these viruses, it protects [against] other viruses in the family," Vora says. "Since smallpox vaccinations stopped, there's some indication that other ... orthopoxviruses have started to increase in their incidence because there's less immunity." Four other viruses in that family infect people: cowpox, monkeypox, vaccinia and smallpox. All but smallpox generally infect animals — cows, cats or monkeys — then jump to people opportunistically. 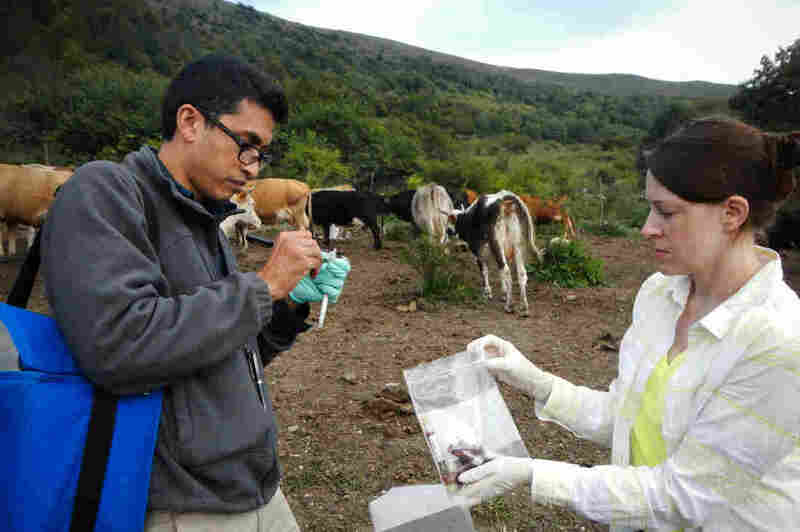 Both of the infected Georgian men caught the new virus from dairy cattle. At first, local health workers thought one man had anthrax — anthrax infections of the skin are relatively common in rural parts of that country. But when tests came back negative, the public health department contacted the CDC for help. Vora and his team quickly figured out they were dealing with a poxvirus. But it turned out to be one that had never been seen before. "The discovery brings up the question of what other viruses might be circulating out there that are even more closely related to smallpox and cowpox," Vora says. Although smallpox was eliminated in the wild, stores of the virus still exist in a few American and Russian laboratories. And there's growing concern that it could be used for bioterrorism. Last year the U.S. government spent about $460 million on a relatively new smallpox medicine, in case the virus was deliberately released in a bioterrorism attack. That stockpile could treat about 2 million people.